Some of the early images had a lovely freshness and dynamism. But it seems that this freshness somehow can't last. As I've become beguiled by atmospheric effects created by colour and paint, the dancers themselves have started to become static. A few days ago I saw that this was partly because they were hit and miss in terms of their proportionality. The eye seems to accept quite a degree of variation here, perhaps because these are not quite the same as human forms, and not in the tradition our eyes are used to seeing. But in repetition, something seems to start to go wrong. It's as if you can only get away with impressions for a while, and then they stop being impressions, and start to die. Without any kind of knowledge or structure underneath, as the freshness falls away, the strength of the image starts to crumble. I knew I would have to get to measurement eventually. The whole point of these images is that they were created, at least in theory, in relation to strict rules of proportion and form. European commentators, and some Indian scholars, have suggested that these canons restricted 'artistic creativity', but to some extent that is arguably missing their point. 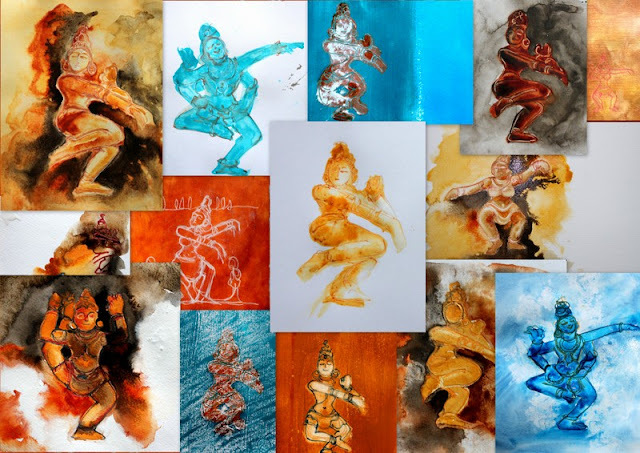 The images I'm studying were all created either to become physical vessels for the actual and literal descent of God (with a capital G), or to adorn the walls of temples which housed such images. The temples themselves were created in relation to all sorts of geometric and philosophical principles which were focussed on the enormity of such a vision and task. One of the things that fascinates me about all this is that, from a European viewpoint, you might imagine that an image designed to physically embody the divine force of the universe would be a grandiose and sombre thing. And yet these images are the opposite of that; they move and dance, festooned with sparkling jewels, sometimes smiling, writhing and undulating with fecundity and life. My current conundrum is the realisation that my representation of these vibrant, moving forms have lost their life, and that this may be partly because I am not paying attention to their measurements and proportions. I tried measuring more carefully, but the image still died (and was still unbalanced, despite all attempts). Today I went back to what the texts say about proportion, and realised that my eye had been completely misleading me as it read these images. I'm just at the start of a project which focusses on the intersection of ritual, philosophy, story, and aesthetics in 10th Century India. I have no clear ideas at the moment about what will happen. I just know that I love the fact that art in India, historically, at least, was completely interwoven with everyday routine, intellectual thought, and 'religious' observances (there's a big question mark over the idea of what we think of as 'religion' in India, both then and now). For now, I'm focussing on dance. I've started by beginning to study my photographs of carved stone reliefs at the temples at Tanjavur and Chidambaram in South India, and cast bronzes created around the same time as these temples under rule of the Chola kings. This period is often seen as a high point of Indian art, although this is likely to be an aesthetic judgement strongly influenced by European values. 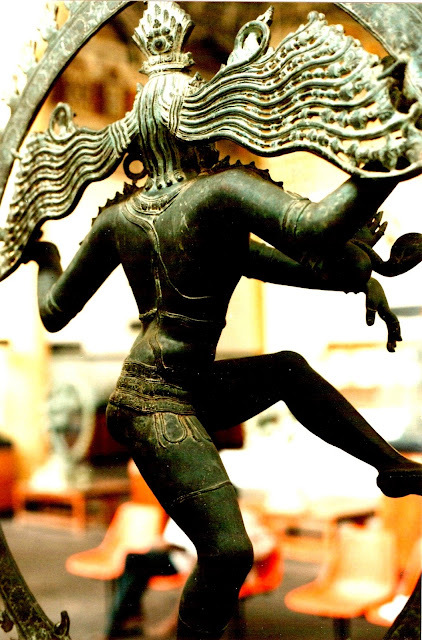 Nonetheless, the forms, particularly of the Chola bronzes, are quite extraordinary. I'm fascinated simply by the process of exploring these forms with paint or pencil. I've only done a few so far (here). Each dancer seems to have a different personality, which seems to partly be due to how I manage to render the face. This, in turn, at least for the stone reliefs, depends upon how the stone has weathered on that part of the image. Today I saw, for the second time, how easily the form becomes static. The original, carved in stone, has such life (there is a specific intention here, if I remember rightly, about the figure being rendered in such a way to show the prana, or life force, which animates the body). I'm trying to be quite loose and impressionistic, but at the moment many of my images are missing this sense of life, the animation of the originals.